One of the things I miss about spending a day in the open country in Sergiyev Posad are the walking clubs. Although I believe there’s nothing better than taking a walk in the company of your own mp3 player, local-based rambling clubs would be a welcome addition to the whole idea of getting outside. I do take walks but I don’t venture to go far – only walking just as long as I enjoy it. The relatively warmer and calm weather in the last couple of weeks in Sergiyev Posad was an encouragement to take another chance – so did I. I woke up early on Saturday, put my recording gear in a backpack, got a baseball cap from a far corner of the wardrobe to clip the Church Audio mics… and that’s it. 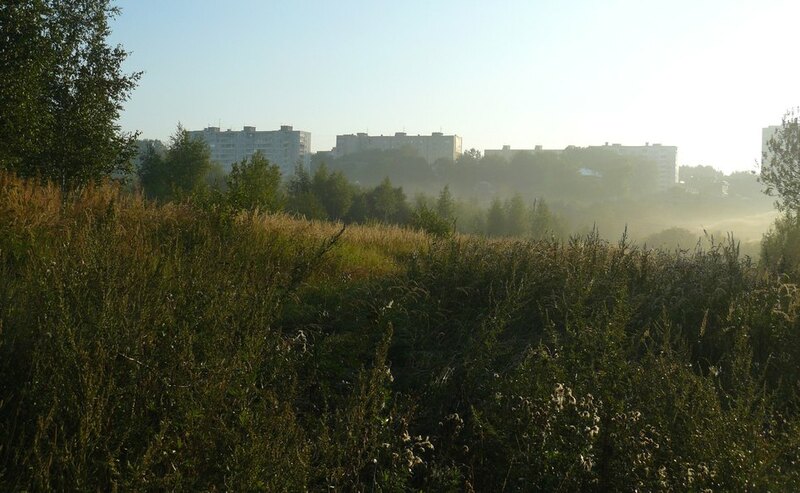 I arrived at the Uglitch bus station, North Sergiyev Posad at about 7 a.m. And before leaving for the the wild nature, made a farewell snippet of the civilization, the sound a laundry (heard on oontz.ru before – here). Then back to the bus station to go further East to the locality known as Birchwood Grove not far from the Grazhdanka area. The first recording was of a brook also known as Vondyuga river in Sergiyev Posad. The town is now left behind, reminded only by the rumble of traffic. Behind the water sounds, a raven call could be heard and here’s a closer listen. I love the sound of a train at the end also. It’s about 2 km between us stretching across the town but mind you, in the early hours sounds reach way further. I like these recordings very much Vladimir. You’ve captured these evocative sounds perfectly. I especially like the delicate sounds of the brook. The name Birchwood Grove is interesting. It has a very English ring to it. Hello Des, I am really glad that you have liked this recording. I wanted to give my Church Audio mics and preamps one more try using it more extensively during the recent days, and I hope I am not the only one who enjoys the sound of it. Also, I find it difficult to translate local place-names into English since they often contain some peculiar words and terms such as Mobile Mechanic Division (widely known as PMK for short in Russian) as a locality name. I am aware it sounds a bit strange as a toponym but that is the part of our history, and one cannot escape it. Translating will make sense I believe. The same is with the Birchwood Grove – it’s a great name in itself but introducing it here as Berezovaya Roscha (the way it sounds in Russian) delivers no idea. It’s good to see Birchwood Grove sounds adequate, at least I hope so! Don’t worry Vladimir. Birchwood Grove is perfect and it conjours up exactly the right image for me.